My first draft of this post was on paper, written by hand. I’m not an analog romantic – most of my world is digitally mediated, and I will normally do all of my drafting and rewriting on a computer. But recently I’ve been reconsidering some of the digital processes that we think of now as “normal”. Last year’s Douglas Coupland exhibit at the Vancouver Art Gallery (including his “I miss my pre-internet brain” meme), a recent gift to me of several manual film cameras, and mostly, a long conversation with Ron Smid at his gallery in Whistler this past spring, have all prompted me to reflect on what the medium we use adds to the way we think. Sitting outside the gallery is a large camera on a wooden tripod. 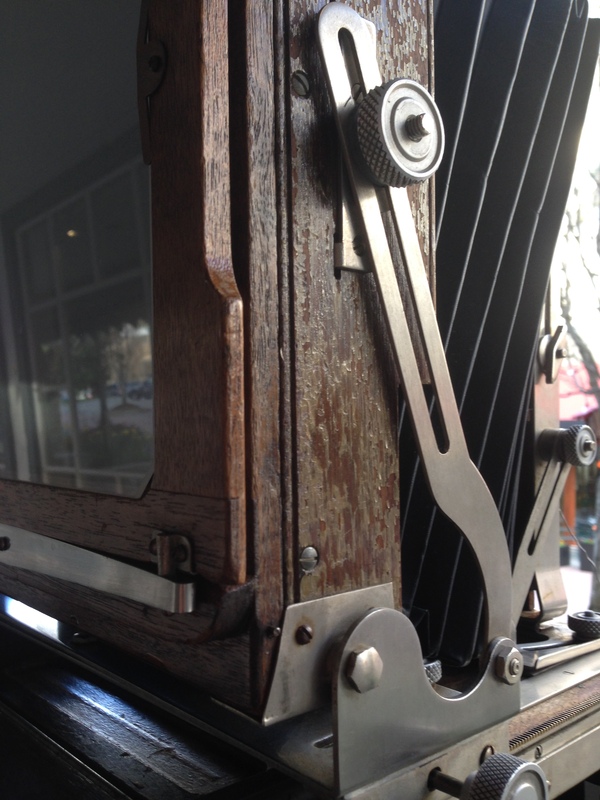 Made of wood and fabric, it looks antique, like a museum piece, and it seems to recall an earlier age of photography. Images of Ansel Adams under his camera hood come to mind, or the Bugs Bunny photographers under a black cloth behind the camera. 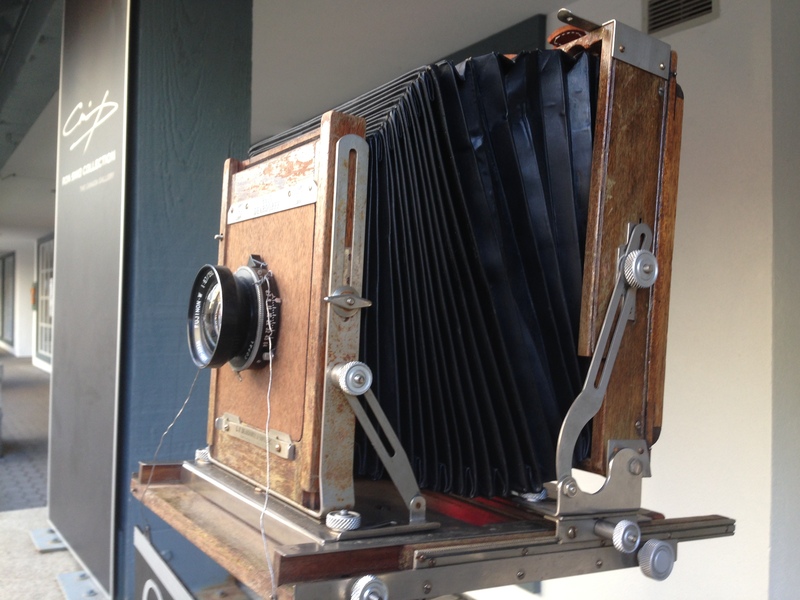 But this is Ron Smid’s workhorse, his pride, and the tool he uses to create the stunning images in his gallery. Walking past the camera and stepping into the shop, I am confronted by huge, powerful landscape images: sharp, primal stones in the foreground, with pinsharp bursts of color in the form of beautifully textured lichens and mosses. The contrast of colour picks out further texture. At eye level, the large size of the print gives the image a solidity and power that invites you to step into the frame and walk the rocky, dangerous trail to the new vistas along the rugged shore of Brier Island. I turn away from experiencing this powerful artwork, and begin talking to the man at the gallery’s desk. It turns out that he is the creator of all the images in the gallery. As a long time photographer I immediately fall into conversation with him about his work and process. I expected him to detail a cutting edge digital process behind his work, but I was surprised, and surprisingly pleased, to learn that his workflow is entirely analog, from the old school 8×10 view camera that he uses to create his images (the one on display outside the shop) to the master printer Michael Wilder who brings his work to life in the darkroom. We talked for a long time about what is possible with analog photographic technology, and reminisced about past processes that are no longer commonly used. And the proof really is in the fantastic quality of his images. He has been able to use film and darkroom printing to create beautiful, powerful images (and while the images on his website are awesome, they give only a taste of the power of the experience of his work in person at the gallery). I’m not giving up my digital world, and I love the power of it. Self publishing my thoughts in this blog is just one way it can extend me, as is Skyping or FaceTiming my family in the east, connecting my growing children to their grandparents. 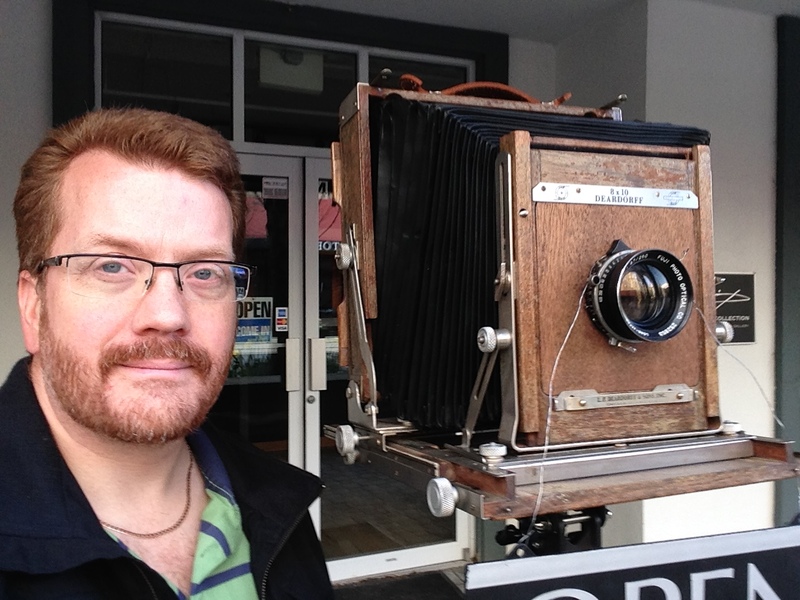 (Even my self indulgent “selfie” with Ron’s camera, below). But there is more to consider. Its become commonplace to think of technology as “tools”. “You have to use the right tools for the job” is a phrase I hear in discussions on implementing technology in the classroom, sometimes from tech enthusiasts, sometimes from cynics. But every tool has a way to be used, its own process. Different processes engage us in different ways. and result in different kinds of experiences. The less recently developed, less “high tech” way of doing or experiencing something might actually be “better”, in the sense that it might produce a more profound experience or understanding. This is certainly the case with Ron Smid’s work, and it is the case for me as I look to revisit the experiences of writing on paper and photography with film. What about you? What do you miss about your “pre-internet” ways of experiencing the world? Are any of them worth revisiting? Enjoyed the amazing pics by Ron Smid. The textures and colours are my kind of pictures, only wish I could take some like that too. Your comments were so appropriate too, we can enjoy the best of both worlds and remember they are all tools for us to use. Love the selfie…can I copy it? Of course you can copy it! We will take you to his gallery in Whistler next time you are in BC!